I re-ran my compression testing from November to show the on-disk savings that compression in WiredTiger allows in my last post. The other part of that testing was to see if we could show a benefit to having compressed data from a read perspective. As I explained back in November, one of the scenarios where compression can help is when there is only limited IO capacity available. Once again, to simulate that, I used a relatively slow external USB 3.0 drive to simulate reasonable IO constraints and then recorded how long it took to read my entire data set from the on-disk testing into memory from that disk. The results show that benefit, though the results in WiredTiger are somewhat hampered by the issue described in SERVER-16444. I may attempt to re-run these tests with a more random, index driven read load – as well as being more representative of a normal workload, it should also show greater benefits by avoiding the table scan related overheads. 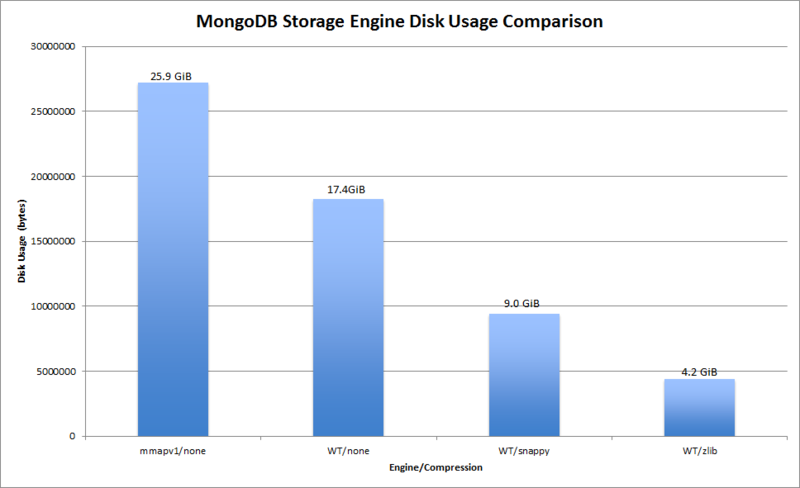 Once again, I think this reinforces the choice of snappy as a good default for the WiredTiger Storage engine in MongoDB. 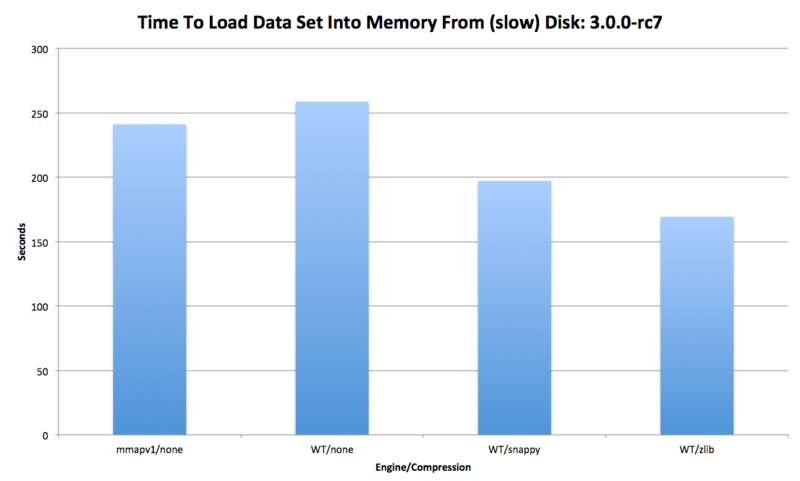 Back in November, with the newly minted RC0 version of MongoDB 3.0 (then 2.8 of course), I ran a series of tests to check out how well compression using the new WiredTiger storage engine worked with a ~16GB data sample. Compression on disk worked fine, but the follow up tests to show the benefits of using compression when limited IO is available ran into issues and I ended up having to run the tests again with an updated version (and the appropriate bug fix). I’ve decided to revisit the compression testing 3 months on – we are now on release candidate 7 and heading for a GA release in March. There have been some new settings exposed to tweak compression as well as a whole host of bug fixes and improvements. I will start with just the straight compression testing and leave the restricted IO piece for later. The config files used for the processes can be found here and all testing was done on an Ubuntu 14.10 host with an ext4 filesystem. The only real difference between the tests this time and last time is the use of mongodump/restore to ensure that all data is the same (previously I had regenerated data each time, so there was probably some variance). 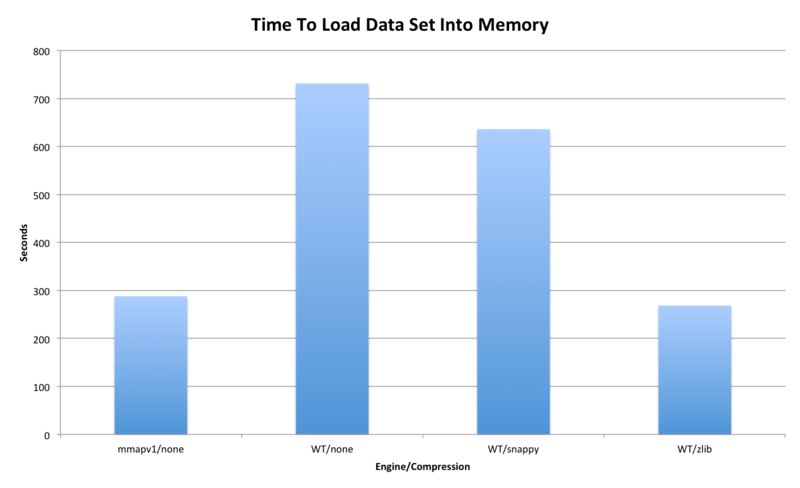 I think that it nicely illustrates the savings on-disk that compression in WiredTiger offers – the savings versus a non-compressed WiredTiger configuration are impressive enough – taking up just 24% of the space, but when compared to the MMAPv1 they are huge, taking up just 16% of the space. It also shows that the defaults for WiredTiger with MongoDB (represented by the WT/Snappy bar) are a good middle ground at just over 50% of the non-compressed WT total and 34.7% of the MMAPv1 usage. It should be noted that the trade off for using zlib rather than snappy is significant, even with just a mongorestore happening. The insert rate with snappy was similar to that with no compression and hovered between 65,000/sec and 67000/sec. With zlib being used rather than snappy, that dropped to between 22,000/sec and 25,000/sec. Now, insert performance was not the target for this testing, so I only mention it as an aside – the first thing I would do to see a proper comparison would be to increase the number of collections being restored in parallel to 4, rather than 1, and then looks to see what else I could tweak to improve things. Hence, if anyone out there is concerned about disk usage with MongoDB, then I would recommend starting to test 3.0 with WiredTiger as soon as possible and see if it suits your use case. Update: I re-ran the read based tests on limited IO also, see this post for details. My (rather popular) first post on this topic explained the benefits of compression (which comes as the default option with the new WiredTiger storage engine) for systems with lesser IO capabilities. The intent was to first show that the new storage engine saved space on disk and then to show that this could be translated into a gain in terms of performance when reading that data (slowly) off disk. The first part of that story worked out pretty well, the data was nicely compressed on disk and it was easy to show it in the graph. The second part of that story did not work out as expected, the graph was a little off from expectations and my initial speculation that it was a non-optimal access pattern didn’t pan out. In fact, I determined that the slowness I was seeing was independent of IO and was due to how slow the in-memory piece was when using WiredTiger to do a table scan. Needless to say, I started to talk to engineering about the issue and tried tweaking various options – each one essentially reinforced the original finding. It was soon obvious that we had a bug that needed to be addressed (one that was still present in the first release candidate 2.8.0-rc0). I gathered the relevant data and opened SERVER-16150 to investigate the problem. Thanks to the ever excellent folks in MongoDB engineering (this one in particular), we soon had the first patched build attempting to address the issue (more, with graphs after the jump). Before that, for anyone looking to reproduce this testing, I would recommend waiting until SERVER-16150 has been closed and integrated into the next release candidate (2.8.0-rc1), you won’t see the same results from 2.8.0-rc0 (it will instead look like the first set of results). CAVEAT: This post deals with a development version of MongoDB and represents very early testing. The version used was not even a release candidate – 2.7.9-pre to be specific, this is not even a release candidate. Therefore any and all details may change significantly before the release of 2.8, so please be aware that nothing is yet finalized and as always, read the release notes once 2.8.0 ships. Anyone that follows the keynotes from recent MongoDB events will know that we have demonstrated the concurrency performance improvements coming in version 2.8 several times now. This is certainly the headline performance improvement for MongoDB 2.8, with concurrency constraints in prior versions leading to complex database/collection layouts, complex deployments and more to work around the per-database locking limitations. Eliot also gave a talk about the new storage engines at MongoDB London last week after announcing the availability of WiredTiger in the keynote. Prior to that we were talking about what would be a good way to structure that talk and I suggested showing the effects and benefits of compression. Unfortunately there wasn’t enough time to put something meaningful together on the day, but the idea stuck with me and I have put that information together for this blog post instead. It’s not a short post, and it has graphs, so I’ve put the rest after the jump.